SLC 03 is specially designed for energy Saving in conventional street light systems. Day light power saving scheme can also save some more energy. Apart from energy saving this can also savemanpower, operating cost and can reduce manual-operating errors. This controller is programmed on longitude & latitude base for the whole year for sunrise and sunset timings. Sunrise and sunset time changes on day to day basis and in one month there is a time change of about 30 minutes. For entire year sunrise and sunset time changes by about 190 minutes. With these much change of time a conventional timer will not serve the purpose. It can save energy up to 8 % against conventional manual operation, Photo sen sors or conventional timers. Our controller incorporates a real time clock with in built battery backup for minimum 8 years. There is no need to reprogram thecontroller even if supply fails for long duration. Real time clock with inbuilt battery with life of more then 8 years (Manufacturer provided 10 years life for the real time clock battery with the accuracy of +/- 60 second per month). Data protection of user parameter by specially RAM which hold the data for more then 10 years with out any power. Month wise civil twilight timings (Day light power saving) which helps precise ON / OFF time in all weathers (Advantage of Sunlight before sunrise and Sunlight after sunset). Password Protection. ( As the systems installed at remote location and in open conditions any body can fingered which create problem for street lighting operation). Scrolling display of events which helps to monitoring the systems. Very easy key board operation. Auto / Manual facility by way of relay operation for faster service mode. 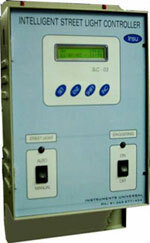 Controller operates 365 days on real-time based clock with reference to longitude and latitude of the locations. Parameter data protection With special device which hold the data for more then 10 years without any power and Password protected. Display 16 character and two lines LCD display with backlight. Installation Indoor type can be installed in existing pole Box. Dimension 235 X 140 X 105 mm Approx. Material of construction M S industrial powder coated with seven tank process.